I was excited to see my first huge jump in followers on my Pinterest account. My Infographics and Social Media board netted 92 then 233 followers one fine afternoon. Optimizing your profile, posting images that are likely to be repinned as well as interacting with your online community are all ways to increase traffic to your pinboards. If getting more followers for your brand, product or business or increasing traffic to your website is your goal, then try working with some of these Pinterest strategies to help you achieve your mark. Optimize your images for repinning to get more repins and followers too. A recent study by Curalate determined the best images were of medium saturation with red being the best primary color to use but more than one color was best. Pin your images on your account and a collaborative board. Read more about group boards in this tutorial. Be sure your profile is completely filled out and the account is verified if you own a website. Draw in additional traffic from your other social media accounts. Be sure to post your pin up on Twitter and Facebook too! 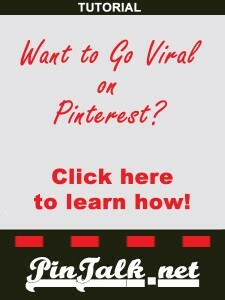 And as with all social networks, repin, like and comment on other pins. This is a community after all. Next Next post: How to change your Pinterest board’s category in 3 steps!